Across the strategies, successful posts anticipated users’ needs, moods and motivations. They were framed around what the organization could do for the user. Instead of shining a spotlight on yourself, highlight what users get from you. Don’t talk about how great your story is, talk about how you help users live their lives. They were about things people are already inclined to interact with. (That requires knowing what your specific audience is inclined to interact with.) Show that you understand your audience’s interests and motivations. Don’t try to force them to talk about or care about something that doesn’t fit with their other activities and interests. And recognize that those interests vary by platform. Your audience members might care about national sports or local government in general, but that doesn’t mean they want to use their social feed to talk about it. Respect that. They read like they were written by real people. Embrace your humanity. Users are inviting your voice into their social feed, which is full of people talking to other people. Try to be a natural part of that ongoing conversation. Think about language that highlights common ground and values. We believe in, we value, we support. We’re watching out for you. We’re holding officials accountable. We love living here too. We want you to be informed. We’re responsive to you. We help you live your life. We’re qualified to do this job. They invited people to be their best selves. There’s an aspirational quality to social media. Users want to present themselves, their intellect and their motivations in the best possible light. They want to share things that are consistent with their values. Appeal to that desire and help them fulfill it. Demonstrate that your newsroom reflects your audience’s values. Look for reasons to point out what makes your staff credible or knowledgeable on a specific topic, but focus on the topic more than the staff.  Explain the process behind a high-interest newsroom decision or project. Look for ways to inject your own emotion or perspective into your writing. Especially as you get started, focus on hosting and participating in conversations people are eager to have. As you earn your users’ participation, they’ll be being willing to jump in on more nuanced or difficult topics. Try making conversation the purpose of a post (rather than treating it as subordinate to the sharing of a link). NOTE: This testing was done in 2016. Facebook best practices around sharing have changed, so some recommendations will be outdated. Encourage sharing on posts and topics users will WANT to share, not ones you WISH they would share. Start with easy asks (posts that are obviously helpful, positive or fun). Invite sharing on posts that are in the public interest. When police need help finding a missing child, or a food recall endangers peoples' health, lots of users will see it as a civic duty to help spread the word. Emphasize emotion when appropriate. If users are likely to share because they're proud, outraged, scared or excited, consider whether the framing of your post includes that angle. When you try to spark interest in who you are and what you do, users will often respond. That’s great, right? And that’s how it works in real life … when you say something interesting, you hope for a response. And on social media as in real life, it’s polite to acknowledge those responses. Trust happens when people feel heard. That means that when engagement is a goal of journalism, journalists have an opportunity — and really, an obligation — to be listening. 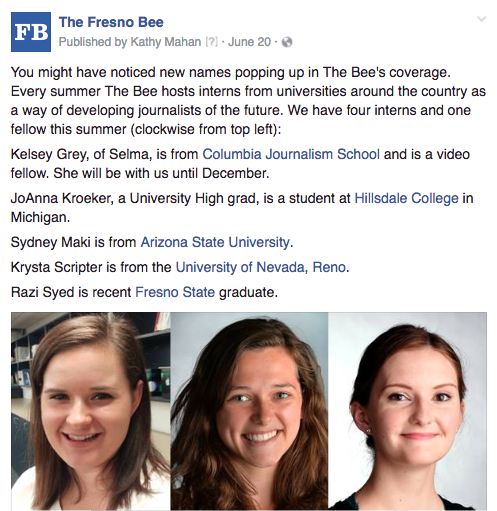 When a user posed a question back to the Fresno Bee about why all their interns were white, she didn’t get an answer. It would have been a good opportunity to explain if diversity efforts are made in the recruitment and hiring process. The same was true when an A Plus user asked a question about an invitation issued by the organization. 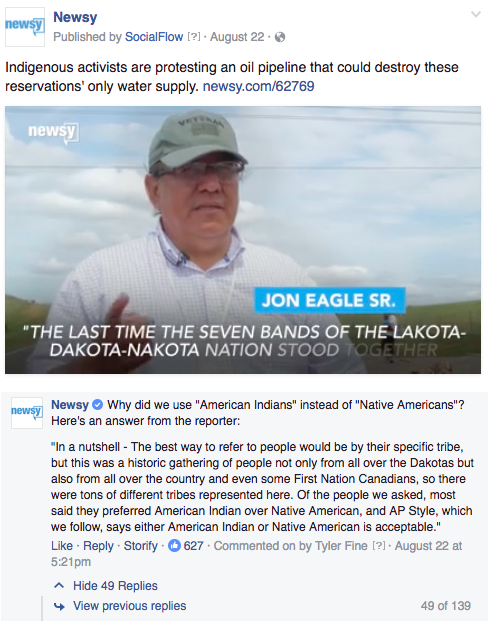 On the flip side, when Newsy was questioned about their use of the term “American Indians” instead of “Native Americans,” they answered. And their comment got 624 likes. Sometimes, users will see the articulation of your value statement as an opportunity to be critical. As you choose whether to respond, remember that you’re not just responding to that naysayer. You’re speaking publicly to anyone who’s listening (most of whom won’t react publicly). Take the time to have a back-and-forth, like Enid did here, when you can. And sometimes you’ll get compliments. When you have a goal of hosting conversation and promoting genuine engagement, there’s no good excuse for being absent. If you throw a ball, you need to be ready to catch it. If you have a huge audience, of course you can’t respond personally to each comment. But you absolutely can demonstrate that you’re present and listening.